Urban farming is still in it’s infancy but there are plenty of efforts to bring food production into our cities and closer to the populations we are trying to feed. These newfangled farming methods combine urban buildings, new technology, hydroponics, and big data to build scalable vegetable and fruit production to our cities. In Boston, Caleb Harper is the Director of the City FARM, which is part of the Open Agriculture Initiative located in the MIT Media Lab. Harper wants to address the needs of a growing world population and the dwindling sources of land and water. Also, he points to the need to bring farming closer to the consumer. But he doesn’t necessarily see his ideas replacing current large scale farming methods. In Montreal, Mohamed Hage is taking a commercial tack on this idea. His Lufa Farms is another large scale effort underway to bring farming to the urban environment. 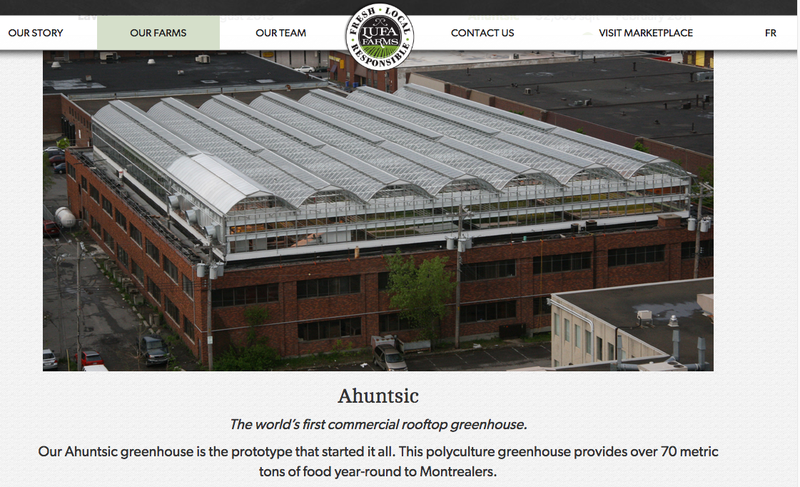 Beginning in 2011, Lula Farms built the world’s first commercial rooftop greenhouse. This 32,000 square foot polyculture facility now delivers 70 metric tons of food to the local population. Lula built a second facility in 2013. This 43,000 square foot facility delivers 120 metric tons of food per year. The Lufa Farm system is designed to be sustainable in terms of water use, energy use, and pest controls. They also deploy technology in their delivery system which utilizes marketing and e-commerce tools to allow customers to select what goes in their $30 basket of food that can be delivered to more than 150 local pick up sites — even on the day the food was harvested. These urban agricultural advancements are not planning to replace the large scale farming that delivers the vast majority of our food. However, it does expand our capabilities to deliver fresh food locally. Perhaps more importantly, these efforts may lead to similar advancements to our current framing system to improve our environment and food production. This entry was posted in Farming Education, Farming Resources, Industrial Farming, Sustainability, Urban Farming and tagged Education, Farming, Food, Fruit. Bookmark the permalink.